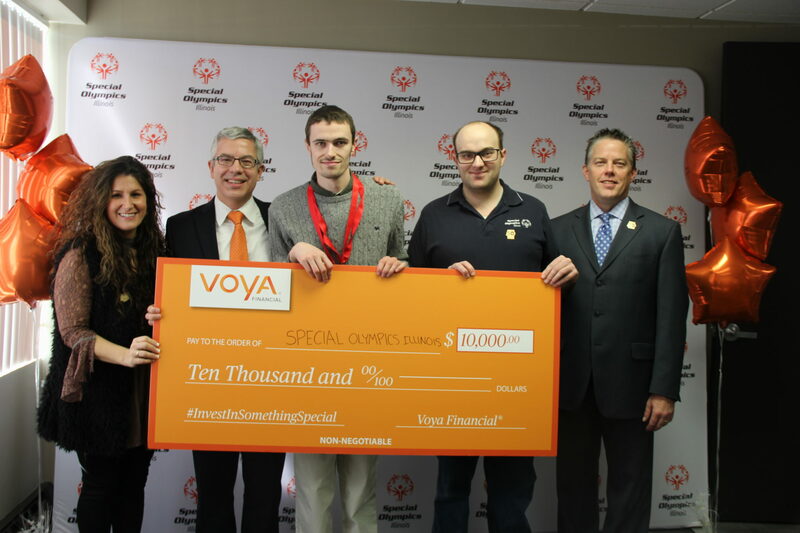 Voya Financial, Inc. (NYSE: VOYA), announced today their donation of $10,000 to Special Olympics Illinois, as a direct result of the success of its Invest in Something SpecialTM effort – a weeklong social media campaign designed to share the goals and dreams of Special Olympics athletes on social media, and to raise money for local Programs. During the Invest in Something Special campaign, Special Olympics athletes from across the country were encouraged to share their goals beyond sport on Facebook, Instagram and Twitter. In Illinois, for example, Erin shared that she wanted to become a Veterinarian. Voya pledged to donate $1 for every like, share and comment on athletes’ #InvestInSomethingSpecial stories, up to $500,000. The response to the campaign was overwhelming, resulting in more than 940,000 people that participated on social media and an amplified donation of $520,000 from Voya, which was shared among the 52 U.S. Special Olympics Programs, including Special Olympics Illinois. The top-performing Invest in Something Special posts included Garet’s about his goal to be the best uncle possible, Brandy’s post about striving to make new friends and Michael’s anti-bullying message. These posts alone generated over 680,000 comments, shares and likes from people around the world interested in raising money for U.S Special Olympics Programs. Voya Financial, Inc. (NYSE: VOYA), helps Americans plan, invest and protect their savings — to get ready to retire better. Serving the financial needs of approximately 13.6 million individual and institutional customers in the United States, Voya is a Fortune 500 company that had $11 billion in revenue in 2016. The company had $541 billion in total assets under management and administration as of Sept. 30, 2017. With a clear mission to make a secure financial future possible — one person, one family, one institution at a time — Voya’s vision is to be America’s Retirement Company®. Certified as a “Great Place to Work” by the Great Place to Work® Institute, Voya is equally committed to conducting business in a way that is socially, environmentally, economically and ethically responsible and has been recognized as one of the 2017 World’s Most Ethical Companies® by the Ethisphere Institute, as well as one of the Top Green Companies in the U.S., by Newsweek magazine. Follow Voya Financial on Facebook and Twitter @Voya. Special Olympics Illinois is a not-for-profit organization offering year-round training and competition in 17 sports for more than 22,500 athletes with intellectual disabilities and nearly 20,000 Young Athletes ages 2-7 with and without intellectual disabilities. Special Olympics transforms the lives of people with intellectual disabilities, allowing them to realize their full potential in sports and in life. Special Olympics programs enhance physical fitness, motor skills, self-confidence, social skills and encourage family and community support. If you are interested in learning more about Special Olympics Illinois, volunteering or providing financial support to help make Special Olympics programs possible, contact your local Special Olympics agency, call 800-394-0562 or visit our website at www.soill.org.